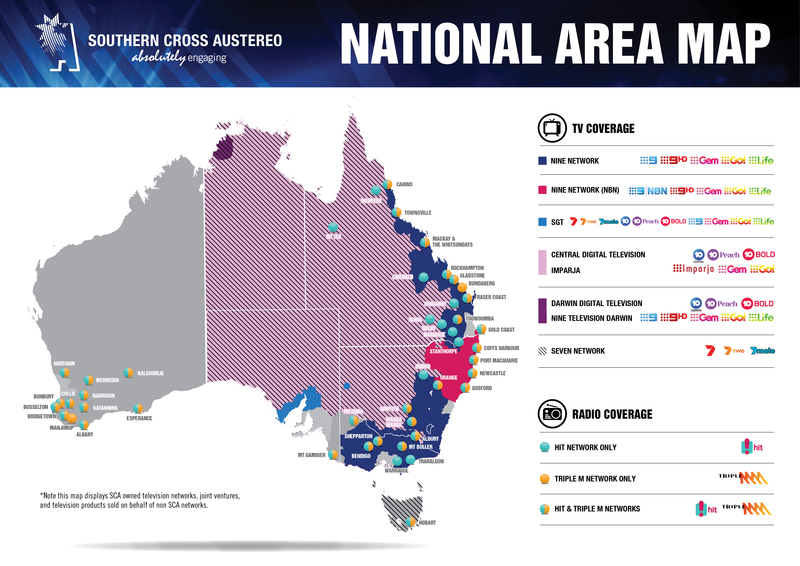 Southern Cross Austereo television services cover most of regional Australia, with affiliation arrangements with all the metropolitan commercial networks. Under the Nine networks brand, Southern Cross Austereo broadcasts TV in the regional Queensland, regional Victoria and regional Southern New South Wales licence areas. SCA also broadcasts the Seven Network channels in Tasmania, Darwin and the Remote Central and Eastern Australia; Nine, Seven and Ten channels in Broken Hill and Spencer Gulf and the nine channels in Tasmania and Ten channels in Darwin and Remote Central and Eastern Australia (in joint ventures). In partnership with the Federal Government, SCA offers the Viewer Access Satellite Television (VAST) services, giving TV to Australians living and travelling in remote Australia and in black-spot areas.